For its original voyage, The USS Enterprise was deployed on a five-year mission that fell slightly short of its initial goal. In the three years that it did fly across the vast nothing of space it found everything: new civilizations, new life forms, new stars, and new suns were around every corner. Few fictional worlds have ever filled out so quickly and so completely as the world of Star Trek. Today it is almost as vast as the universe it travels. There are movies, new shows, new books, figurines, toys, and costumes devoted to even the tiniest moment of adventure as experienced by the ship’s crew. 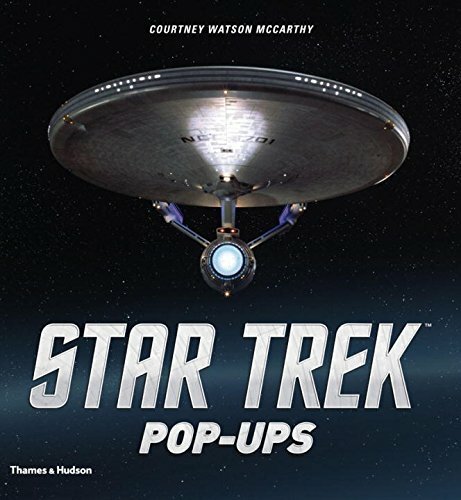 Star Trek Pop-Ups by Paula Block and Terry Erdmann (authors) and Courtney Watson McCarthy (designer) explores that mythical universe in sweeping detail and eye-raising art in a broad and thrilling look. Working with paint, paper, photos, and razors with a blade so thin it disappears when you turn it sideways Star Trek Pop-Ups will stun fans and non-fans alike. Almost every incarnation of the legend is featured. Across six detailed and complex pop-ups, it features not only the mechanical aspect of the show, but the crew as well. Each pop-up is accompanied by a concise and informative story about the three-dimensional image as well as a few photographs from the show or movie. The original Star Trek series is represented by The Corbomite Maneuver. It features the USS Enterprise while it is facing down the Fesarius. As it did in the show, the ship rises dramatically out of the shimmering lights to do what it can against its enemy. The image that McCarthy used for her Enterprise is based on the one used in the recently remastered Blu-Ray editions of the series. The difference between the 1966 ship and the current version in the remasters is subtle as the artists and restoration team worked hard to stay close to the spirit of the original art team’s visionary work. McCarthy matches their dedication as the Enterprise appears before us. The second image is in tribute to The Trouble with Tribbles. This time out you feel as if you are standing right down the hall as Kirk, Spock, and the rest of the crew as well as a few diplomats and dignitaries worry about the grain they find themselves drowning in in Tribbles. Like any world, there is a lot of evil inside the Star Trek universe. McCarthy’s best work may be in the way that the Borg rises from the boiling orange, red, and black of the universe. Just off to the left of this terrifying image is a small, unmarked square. Pulling at it you find that it is considerably small image of the Enterprise. The difference in size between the Borg and the ship is stunning. It puts the immensity of the crew’s challenge in fighting the Borg in perfect perspective. Each of the figures is a moment of silent connection with every fan of Star Trek. The Klingon Bird of Prey is as threatening in a roughly twelve inch version as it is on the show! A friend of mine stopped by while I was working on this review. Impressed with the book, she commented that Star Trek Pop-Ups is simply a high-definition and very modern version of the centuries old publishing tradition of pop-up books. My side of the discussion held that this volume is not exactly an advancement in technology like high-definition television is, but a continuation of an age old art form. Yes, there have been improvements in binding and structure in the physical composition of the book. But designer McCarthy is working in exactly the same space and within the same rules as a 15th century book binder. She, like the first binders did all those years ago, has to see the object in three dimensions where it once had none. Like a sculpture finding a figure in a block of stone, she pulls the Starship Enterprise from flat paper and glue and paint. Like the sculpture wields a hammer and chisel she moves cutting tools, various razors and brushes a thousand times before she arrives at the final image. Published in 2004, The Big Big Little Book Book: An Overstreet Photo-Journal Guide examined the history and art of Big Little Books. Almost forgotten today, Big Little Books were selling a million a month right before Superman hit in Action #1. While the publishing phenomenon of Big Little Books was indeed the focus, the book also took a side trip into the history of a related genre, pop-up books. At the time the book was being assembled, I worked at the publishing company, Gemstone Publishing, which was creating the book. While I was working on another project at the time, this did give me a chance to review and examine not only numerous big little books but pop-up books from the late 19th and early 20th century. They were right down the hall! Star Trek Pop-Ups is museum quality, state of the art craft in an art form that has been around for at least 700 years, if not longer. And of course it has that Star Trek thing going for it, too. . . .